Handmade greeting card is fun and different. 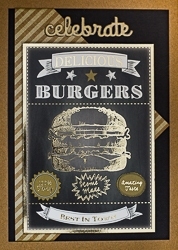 "Celebrate" with this layered burger lover's card that provides texture and excitement. Panel inside is blank and ready for your special message, or read below for more options. Card size is 4 1/2" by 6 1/4" and has gold foil accents. Note: Available in quantity of one.